Hello everyone, today we’re going to be doing a review of Rip Curl watches for men and will feature some of their most popular timepieces after. Rip Curl is a major Australian designer brand that is a manufacturer and retailer of surfing sportswear and related products. They’re one of the top surf brands along with Quiksilver and Billabong. For more information on them check out the Rip Curl Wiki page. 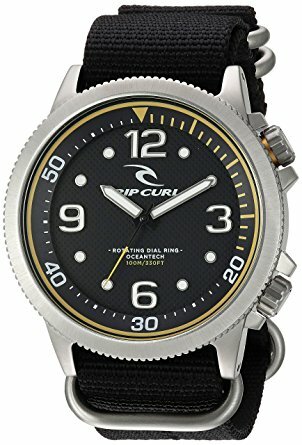 Are Rip Curl Watches Any Good? So are Rip Curl watches actually any good? I’ve actually got just one Rip Curl watch in my personal collection of over 60 watches. I’ve found it to be a hard wearing reliable timekeeper which is perfect for summer days. The brand tends to produce affordable men’s surfing summerly style watches that are well built with quality components. They have a wide variety of styles and designs available so there’s likely to be something here for most people. 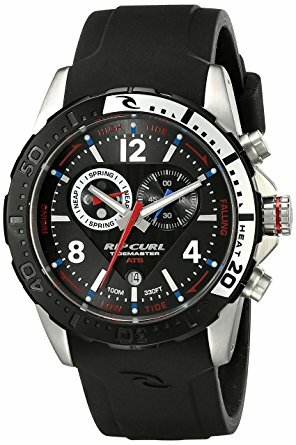 So in my personal option, yes I think Rip Curl watches are good, they offer value for money and a range of styles I enjoy. 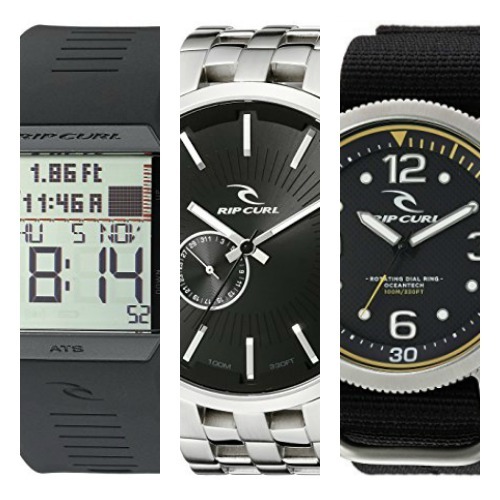 Below I’ll be featuring 5 popular Rip Curl watches suitable for men. 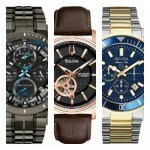 If you have any questions about any of these watches just comment at the bottom and I’ll help you out as soon as I can. First up on today’s list of the top men’s Rip Curl watches is this versatile tide display watch. It’s built with a stainless steel casing that has a polyurethane surround with a total diameter of 41mm and a thickness of 14mm. The strap is also made of polyurethane and fastens with a buckle clasp. The dial has a large digital display which is able to showcase plenty of useful information all on one page. It features 500 pre-programmed tide locations in graph or detailed display. Extra functions include an alarm, stopwatch, countdown timer, date display and back light. Powering this affordable tide watch is a reliable and accurate quartz movement. An acrylic glass is used to protect from shattering. Last but not least is the 100m water resistance rating which is useful to have. 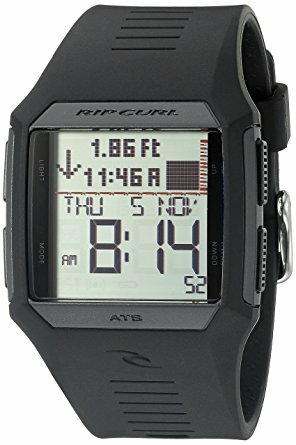 You can read my full A1119-BLK Rip Curl watch review here soon. Next up on today’s list is this popular Rip Curl dual display watch. 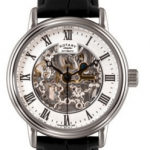 This timepiece has a stainless steel casing with a diameter of 45mm and a thickness of 12mm. The strap is made of a comfortable genuine leather and fastens with a buckle style clasp. The dial features a dual digital and analogue display with slim baton style hour markers and lume coated hands. The seconds hand is red which adds a nice bit of colour to the design. Powering this men’s Rip Curl watch is a reliable and accurate quartz movement. A mineral crystal glass has been used to offer better protection from scratches and shattering. The watch also has a 100m water resistance rating which is useful to have. You can read my full A2920-90 Rip Curl watch review here soon. Here we have a Rip Curl diving style watch. Check out more of the best dive watches for the money here. The timepiece has a rounded marine grade stainless steel casing with a 44mm diameter and 13mm thickness. The strap is made of a black coloured silicone and fastens with a buckle closure. The dial features an easy to read design with large bold hour markers and numerals. Additional features of this watch include luminous hands and an automatic tide system. There’s also a useful date display at the 6 o’clock position. 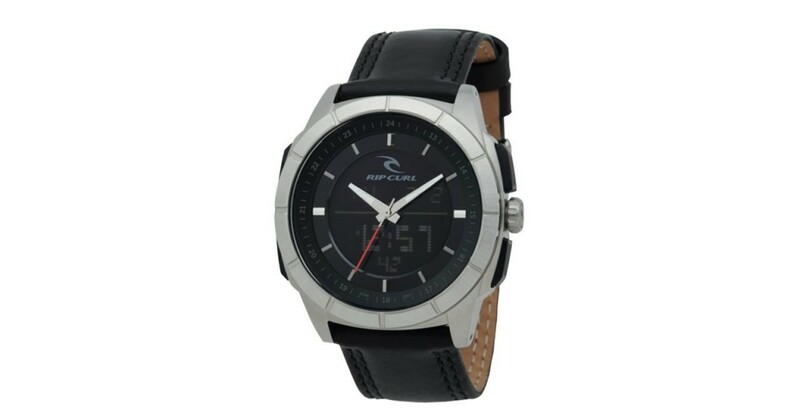 This men’s diving style Rip Curl watch is powered by a reliable and accurate quartz movement. It features a 100m water resistance rating which is great to see. Protecting the dial is a mineral crystal glass for scratch and shatter resistance. You can read my full A1115 Rip Curl watches review here soon. Up next we have a Rip Curl oversized men’s watch. This timepiece has a 50mm marine grade stainless steel casing with a thickness of 12mm. The strap is also made of stainless steel and has a width of 26mm. It fastens with a fold over push button clasp with safety. I’m a big fan of this simple and easy to read dial design. The hands and hour markers have a slim baton style design and are coated in lume for better visibility in dim lit conditions. There’s also a smaller sub dial used to display the date. 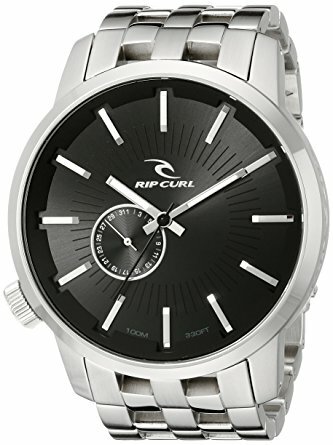 At the heart of this Rip Curl men’s watch is a quartz movement for accurate and reliable timekeeping. A mineral crystal glass protects the dial and offers a decent level of scratch and shatter resistance. This watch also has a 100m water resistance rating which will come in handy. You can read my full A2227-BLK Rip Curl watch review here soon. Last up on today’s list of top Rip Curl watches is this sports timepiece. It’s constructed with a stainless steel 42mm casing that has a thickness of 12mm. The strap is made of a tough nylon and fastens with a buckle style clasp. On the dial we have a very clear and easy to read bold display with a combination of numeral and dot hour markers. These are coated in lume for better visibility in dim lit conditions. Powering this Rip Curl men’s watch is a quartz movement that’s both reliable and accurate. They’ve used a mineral crystal glass which is great for shatter resistance and has a good level of scratch resistance. It also has a 100m water resistance rating which is useful to have. You can read my full A2963-BLK Rip Curl watches review here soon. Thanks for taking the time to read through today’s Rip Curl watches review. What was your favourite model featured today? Comment below and let me know. 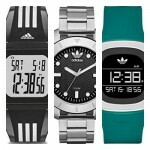 5 Best Adidas Watches Review – Are They Any Good?